The 3% Movement has released initial findings from its pledge to improve equal pay across the industry. The cultural tsunamis like MeToo and Time’s Up which have crashed down on adland in the past few years have given way to unprecedented (and long, long overdue) transparency. Those who hide in the shadows are called out. And those who abolish opaqueness are celebrated. This is the new norm. As positive transformation slowly sweeps the industry, pay equity has become a top priority for agencies struggling to navigate the territory. That’s where The 3% Movement comes in. Last year, its consultancy arm noticed a pattern. "Agencies wanted to talk about pay equity, but they were afraid," said the organization’s Head of Culture Innovation, Amanda Enayati, who helped launch the 3% Pledge for Pay Equity along with a number of agency partners. Enayati explained that, while old-school culture toward the pay conversation remained, the gap was being bridged by a fresh Millennial and Gen Z attitude around openly discussing salary. 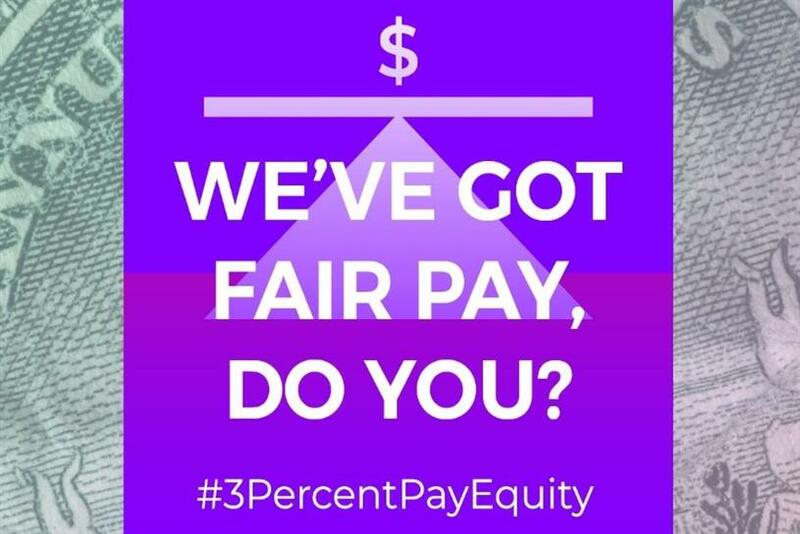 The 3% Movement focused on bringing agencies around one table to share personal experiences and build a blueprint for pay equity going forward. She continued: "The whole idea behind this is to open the door and let some air into the room to help people see what’s working and what’s not. "Agencies need to know they’re not alone in the challenges, and this whole notion of transparency doesn't live in HR, it’s a shared mission within the whole agency." The 3% Pledge for Pay Equity has pulled together initial findings since its launch. Enayati said there’s one major theme that keeps rearing its head. "Everyone is begging for an understanding of a salary band," she stressed, adding that this can be solved by the willingness to adopt extreme transparency and learn from other agencies. Enayati said: "Most agencies extol their purpose, values and culture, but pay equity provides a clear, tangible way to assess whether those intentions are being followed by action. "The other thing agencies mentioned was that the process of pay equity is really challenging, but they noticed that as their diversity and inclusion efforts became more effective, the pay disparities became less of an issue." As part of the research, pledge members shared their best practices to support pay equity. We have continued to develop best practices in hiring and promotions/increases because of our commitment to gender pay equity. The biggest change was when we stopped asking for salary history from any candidate and this practice has resulted in greater gender pay balance for new hires over the last year. One of the things we’ve done that I haven’t seen elsewhere is establish criteria at the outset: this is our process and this is why and these are the times when employees will be up for annual pay increases, etc. Make sure there’s transparency around the nuts and bolts of your process and how salary decisions are made. Explain the inputs, including tenure and market and all sorts of other things. Giving that transparency is powerful. I’ve worked in places where they had zero ideas of what ballparks people are in and that’s not setting people up for success. You have to give employees the tools they need to advocate for themselves. We have salary bands and everyone who is hired falls within a band. All of our positions are banded. At the beginning of each year, managers are given allocations for promotions and bonuses. Bonuses are merit-based and the creatives are evaluated based on the impact they’ve had on the client’s business. We pay in ranges and pay consistently across the country, by responsibility level and whether it’s a local or regional role. The data can be intimidating, but change doesn’t have to take place in one stroke. We first examined our practices and policies, established a timeline and then began the process of fixing any pay gaps we found. The ongoing challenge is that this is not a static thing. If a company says they say they solved it, I’ll be shocked because there are so many factors that change and dynamics we can’t control – things like client budgets and what we’re getting paid and market demands for talent. All these factors are changing and are outside a company’s and agency’s control, and balancing these constraints can be a challenge. That’s why we find the annual pay equity review is so very important. It allows you to take a point in time and identify any disparities that have happened over the year and hold ourselves accountable and come up with an action plan on how to address them. Our review allowed us to identify blind spots and we collected a list of questions to ask ourselves at key junctures. it’s really important to have a proper system in place. We have a rating system in place, but we have to spend time trying to make sure everyone using the system understands and interprets it the same way. Founding agencies: BBH, Campbell Ewald, Deutsch, Doner, 11, Forsman & Bodenfors, FCB, Golin, Havas, Mekanism, Momentum, PMG, Swift, The Martin Agency, VJ, Wongdoody, Zambezi. The number of agencies involved with the movement continues to grow. Giant Spoon, MullenLowe and Possible have signed up to the 3% Pledge this year.